Celebrities keep sharing throwback pictures that take the internet by storm. 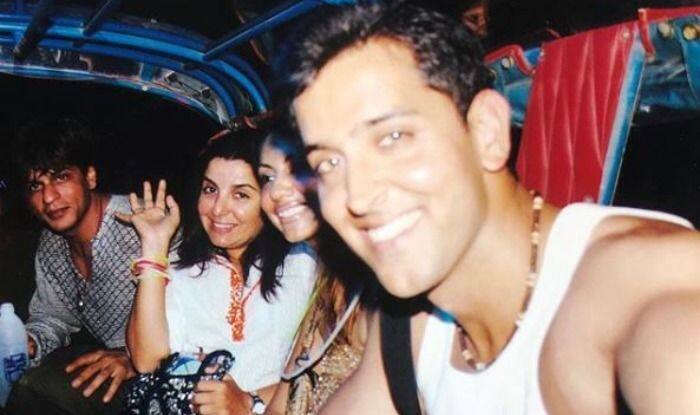 Farah Khan who shares a great bond with Shah Rukh Khan, Gauri Khan and Hrithik Roshan recently shared pictures from their younger days that will make you feel nostalgic. Farah, who has worked with both Shah Rukh and Hrithik in many films and is pretty close to them. Sharing a ‘tuesday throwback’ picture along with Shah Rukh, Gauri and Hrithik, Farah captioned it, “Tuesday throwback!! New year s eve.. Only in Koh Samoi could @iamsrk @hrithikroshan @gaurikhan travel in a TukTuk..#memories #2003#nighttoremember @putlu @udayc sorryyyyy ul we’re sitting on the opposite side”. Yesterday, Gauri was spotted with her younger son AbRam Khan outside designer Monisha Jaisingh’s store in Mumbai. While both mother and son dressed in casual wear, AbRam’s cool pair of mismatched shoes grabbed all eyes. A few days back, Shah Rukh shared pictures of his son Aaryan Khan and AbRam on social media. In one picture, one can see Shah Rukh and son AbRam looking closely at something that looks like a report card. In the other, the two brothers can be seen relaxing on a sofa and sketching on a sketch board. On the professional front, Shah Rukh was last seen in Anand L Rai’s Zero that received mixed reviews from the audience. The film also starred Katrina Kaif and Anushka Sharma in pivotal roles. Shah Rukh played the role of a dwarf in the film and was immensely appreciated for his performance. The actor was earlier said to star in Rakesh Sharma’s Saare Jahan Se Achcha but had reportedly backed out. Hrithik, on the other hand, will next be seen in Super 30 where he will be essaying the role of mathematician Anand Kumar that is said to release later this year.